decisions, especially many of them, pertain to previous years with officially issues rulings, for which, as you are aware, there is distinct religious sensitivity. 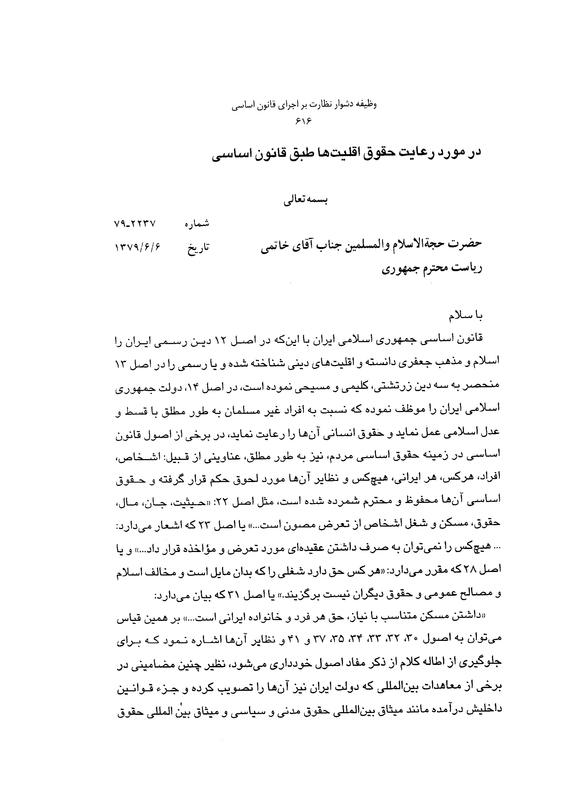 For example, in attachment 5, you will observe that, addressing the Office of Records of Documents and Property Deeds of the city of Khormoj, the Sharia Judge of the Revolutionary Court of Boushehr has declared: because the entirety of the properties and houses belonging to the misguided sect of Bahá’ísm in Khormoj and its vicinities have been confiscated and relinquished to the Foundation for the Underprivileged, the documents under the names of Bahá’ís for their lands, orchards, and houses must be transferred to and registered in the name of the Foundation for the Underprivileged of Boushehr. 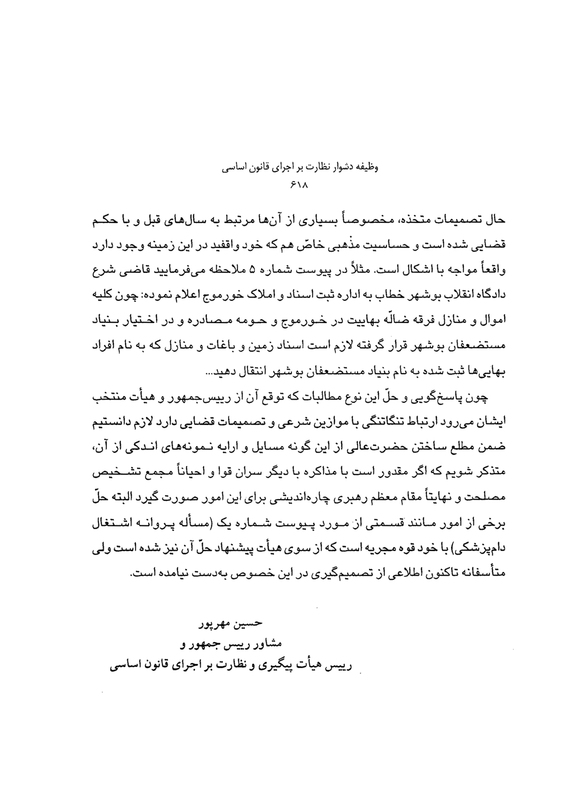 Because accountability and solution for such problems, which is expected of the President and his cabinet, is tightly related to judicial decisions and sharia standards, we found it necessary, while informing Your Excellency and presenting a small sample of evidence for it, to emphasize that, if possible, other high officials and possibly the Expediency Council, and ultimately the Supreme Leader be consulted to come up with a resolution for these matters. 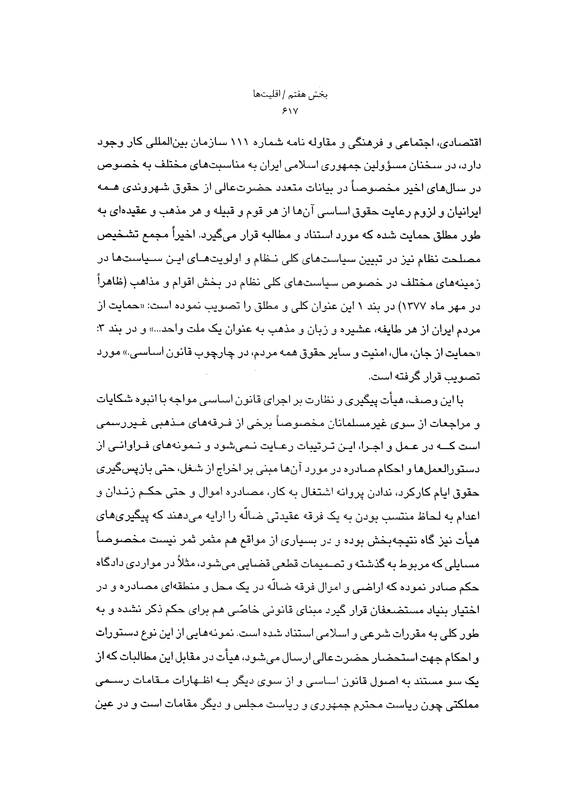 Of course, solving some of these issues, such as the one in a section in attachment 1 (the issue of work permit for a veterinarian), falls within the domain of the executive power, for whom solutions have been suggested by the Board, but unfortunately, so far, we have not received any information about any decision on this matter.